Oberlin Cancels Classes After Series Of 'Hate-Related Incidents' : The Two-Way The latest incident followed a report that a person wearing what looked like a Ku Klux Klan outfit was seen near the Afrikan Heritage House on campus. The college, one of the first in the country to admit black students, declared "a day of solidarity" following the incidents. More than 1,000 people turned out Monday for a Demonstration of Solidarity at Oberlin College. Classes were cancelled after a string of racist incidents on campus. Oberlin College is a bastion of liberalism that was one of the first colleges in the country to admit black students and educate men and women together. On Monday, it canceled classes and declared "a day of solidarity" after a person wearing what looked like a Ku Klux Klan outfit was seen near the Afrikan Heritage House on campus. "This event, in addition to the series of other hate-related incidents on campus, has precipitated our decision to suspend formal classes and all non-essential activities for today," Oberlin College President Marvin Krislov and three deans said in a statement Monday. "We hope today will allow the entire community — students, faculty, and staff — to make a strong statement about the values that we cherish here at Oberlin: inclusion, respect for others, and a strong and abiding faith in the worth of every individual. Indeed, the strength of Oberlin comes from our belief that diversity and openness enriches us all, and enhances the educational mission at its core." Oberlin said the incident is being reported by both campus security and the Oberlin Police Department. 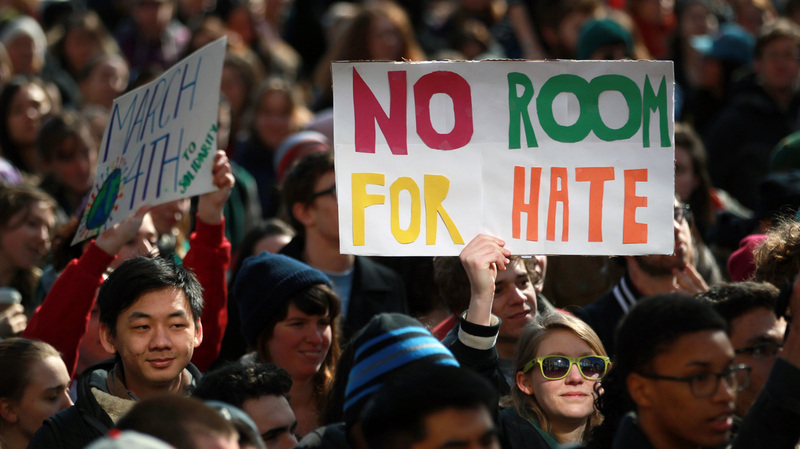 "In the last month, a number of racist and antigay messages have been left around campus, a jarring incongruity in a place with the liberal political leanings and traditions of Oberlin, a school of 2,800 students in Ohio, about 30 miles southwest of Cleveland. Guides to colleges routinely list it as among the most liberal, activist and gay-friendly schools in the country." You can read a timeline of the incidents at The Oberlin Review, which has compiled a list. A Warning: Some readers might find the language offensive.